Four hundred and fifty units of the car — a restyled version of the concept model — are due to be assembled in this pre-production phase before the Vesta goes serial, which is scheduled for September 25. The car was the brainchild of British automobile designer Steve Mattin, who became famous for working with Mercedes and Volvo, and since 2011 has held the position of chief designer for Lada. Another concept designed by Mattin, the Lada XRAY SUV, will hit also serial production later this year. AvtoVAZ began a new phase of life in early 2014 with Swedish CEO Bo Andersson taking command of the Russian automotive producer. The futuristic-looking new-generation Lada Vesta is set to replace the Priora family, Russia’s best-selling car of 2009 and 2012. “It is symbolic that renovation of the Lada brand starts with a car called Vesta,” the company earlier remarked in a statement. The model was named after the Roman goddess of the hearth, home and family. Development costs clock in at around 6 billion rubles ($100 million.) The Lada Vesta’s price on the domestic market is expected to be around 500,000 rubles ($8700), though it varies for four available packages. The sedan will be the first in the product line, followed by a hatchback and a wagon. Vesta production is due to reach around 120,000 units per year. Preliminary information suggests its 1.6-liter engine will pack 87 (8v), 106 or 114 horsepower (16v). Lada Vesta buyers will be able to choose between 5-gear stick shift, semi-automatic transmission and a continuously variable transmission. The racing Vesta TC1 model from the Lada Sport Rosneft team is based on the original Vesta Sedan; it has been participating in World Touring Car Championship competitions since earlier this year. “Lada Vesta is a brand-new product, not based on previous models. 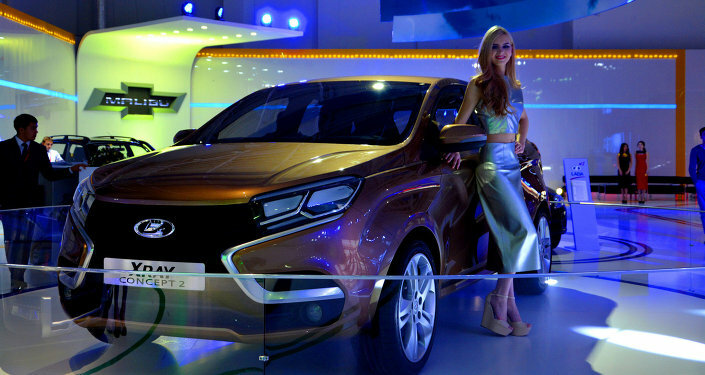 When it appears on the streets, people […] will say, “Wow, cool, a new Lada model, finally I can come to a dealer and do a test-drive!” or even better, “Wow, what is it?” Then brand perception will start changing in people’s heads,” Lada chief designer Mattin told Malina.am. AvtoVAZ is one of the largest car manufacturers in Eastern Europe, with a productive capacity up to a million cars a year. Since 1970 there have been more than 28 million Lada automobiles produced. Since 2012, AvtoVAZ started manufacturing not only its own Lada brand, but also Renault and Nissan models.Outside of Russia, Lada’s top foreign partners are Kazakhstan, Azerbaijan, Egypt and Germany. “We have a strong market share in Germany and Latin America. The Lada 4×4 sells there really well… and we’ve recently signed an agreement with a Nissan importer in Hungary,” CEO Andersson told journalists. He also revealed plans to export more actively to Europe, as since July 1 Lada conform to EU standards, though the CEO didn’t specify which models are targeted for Europe. Lada has been absent on the European market since the fall of 2014, when regulators banned the cars as not complying with EU technical norms.